We have a lot of Lady Bugs (Coleoptera Coccinellidae) this year. To be specific, they are Multicolored Asian Lady Beetles. I counted over a dozen of them on one of the roses and some more on the other roses in the garden. I also found egg sags and larvae under the leaves. This is a good sign for the garden since their primary food is aphids. The birds eat the aphids too but they also leave some damage on the rose buds from their sharp beaks. A lady bug just walks up and down the branches and leaves and chows down on aphids like a vacuum cleaner, no damage done in the process. They even eat while they’re mating…Ha. Aside from the prolific number of them, I also found a strange lady bug…a jet black one among the orange. It has completely black wings with normal lady bug marks on the head. When I looked very closely, I still saw black lady bug spots faintly on the wings. It’s also aggressive. He pumped up and down on the leaf when I got the camera too close, fighting his own reflection in the lens. 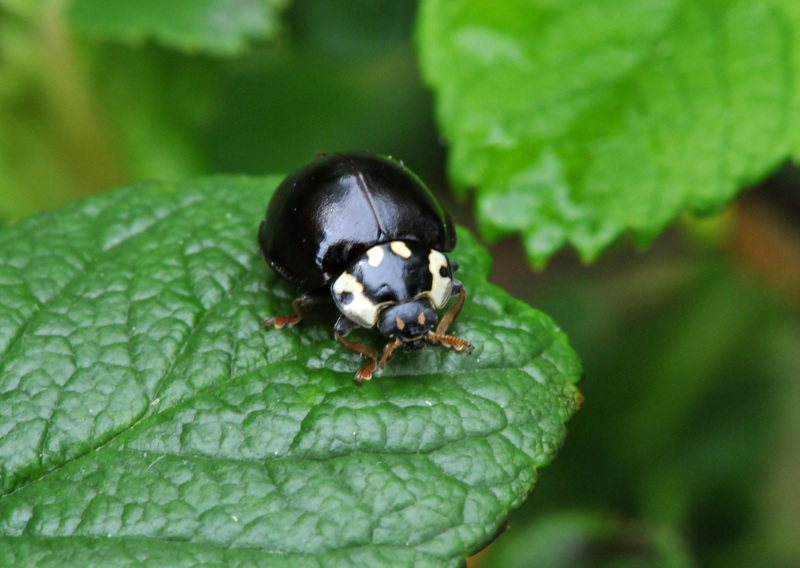 According to the book Insects Their Natural History and Diversity by Stephen A. Marshall, it’s supposed to be a “Fifteen-spotted Lady Beetle” (Anatis labiculata), not a mutant as I first thought it was. I’m glad I have a new addition to the garden this year then. Orange or black lady bugs, mutant or not, do not matter to me, they both work very hard on cleaning up the aphids that abound. I just hope the birds would leave them alone and go for the Japanese beetles instead. Oh to see a mad lady bug… are the males called male lady bugs? I think they are sexually confident enough that they don’t mind being call Lady bugs. Yeah, and they probably where pink shirts too! Actually polka dot on bright orange. Ha..ha. I don’t get many lady bugs in my garden. Any tips for attracting them? We ban chemical products from our garden completely. The lady bugs seem to like roses;plenty of aphids for them to eat. I think they follow their food. 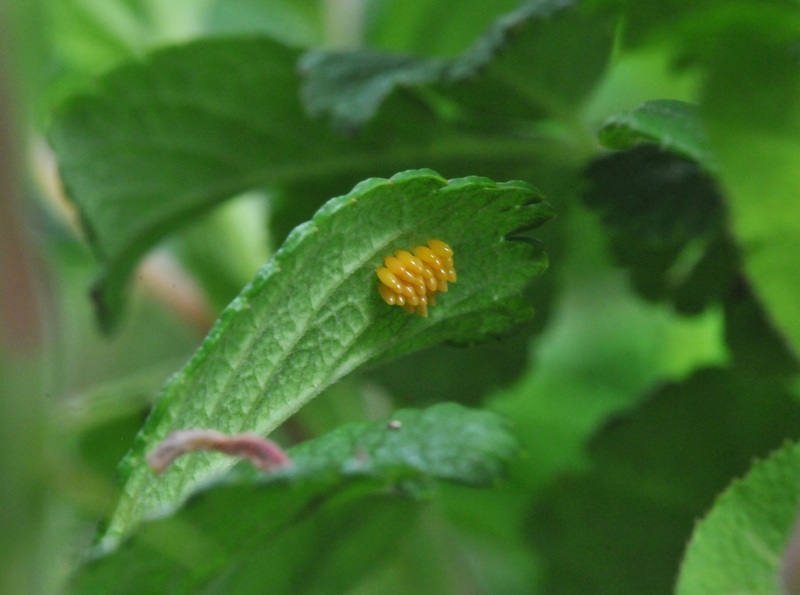 Found a lot of the larvae on Astilbes as well. In Europe, during the Middle Ages, insects were destroying the crops, so the Catholic farmers prayed to the Virgin Mary for help. 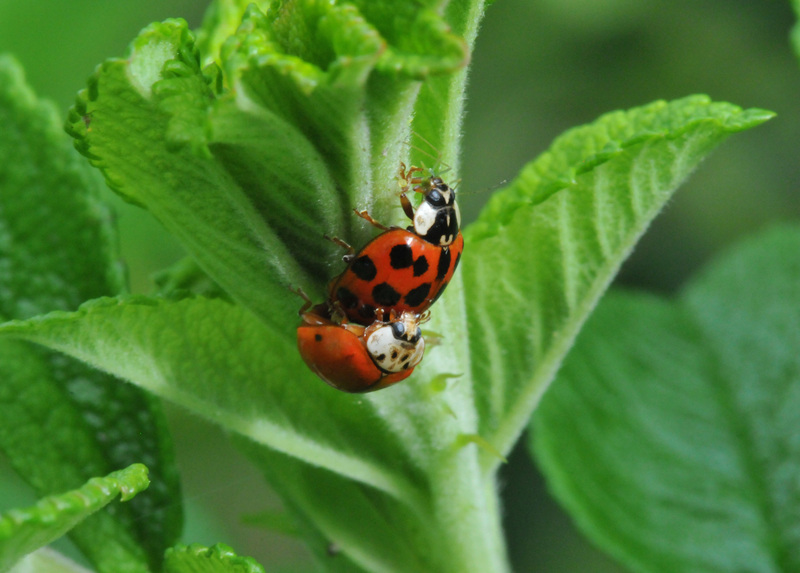 Soon the Ladybugs came, ate the plant-destroying pests and saved the crops! The farmers began calling the ladybugs “The Beetles of Our Lady”, and they eventually became known as “Lady Beetles”! The red wings represented the Virgin’s cloak and the black spots represented her joys and sorrows. They didn’t differentiate between males and females. Also, they are NOT called ladybirds because there are not just ladybirds that are ladies because if they were all ladies they would not be able to mate. I’ve seen it only once so I guess mine was a mutant.